Former Celtic defender Mark Wilson has urged his old club to give manager Ronny Deila more time to make his mark in Europe with the Parkhead club. 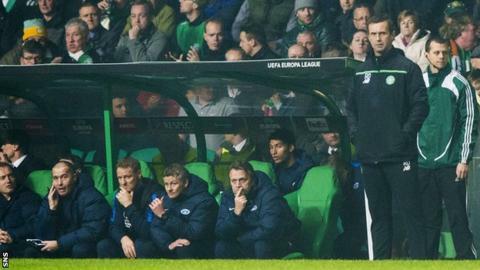 Deila's team were booed off by the home fans as they lost 2-1 to Molde in the Europa League, their second successive loss to the Norwegians. Some feel the Celtic boss is now under pressure, but Wilson believes he deserves more time to develop his team. "It would be very harsh for him to lose his job over this campaign," he said. The loss to Molde leaves Celtic bottom of Group A with two points from their four matches. They have won just two out of 12 Europa League matches during Deila's time in charge, and have twice failed to qualify for the Champions League since he succeeded Neil Lennon as Celtic manager. Wilson, though, believes patience is required if this team is to develop into an outfit capable of competing on the European stage. "I think he should be given the time," Wilson told BBC Scotland. "It's very difficult for Celtic managers to produce miracles. Ronny Deila found himself in probably an unfortunate situation replacing Neil Lennon off the back of such a successful Champions League period, and then Gordon Strachan before him. "You look at Neil Lennon - didn't do so well in his first two seasons, but given the time he produced one of the most famous results in Celtic's history, against Barcelona. That will be fresh in the Celtic fans' memory. "That works the other way, of course, because it's that fresh in their memory that they want it again." Wilson, part of Strachan's Celtic squad who made the Champions League knockout stages in 2006-07 and 2007-08, believes the Parkhead board hired Deila to build a long-term project at the club, and it makes sense to allow the former Strømsgodset boss to see it through. "To build something it doesn't just happen overnight. If it takes three seasons to do it at a smaller club then does he get the time? Perhaps. Celtic is slightly different, but you would like to think the board, having that in mind, would give him the chance to then build his project. "When fans start voicing their concerns then that becomes a problem, because in football, as we all know, chairmen and chief execs listen to the fans. "Perhaps if you give him time, the third season could be successful. "On the other side of it, I'm sure the Celtic fans and board are aware of the financial clout that comes from the Champions League, and if given another season and it doesn't work out, it doesn't look so good for Ronny Deila."